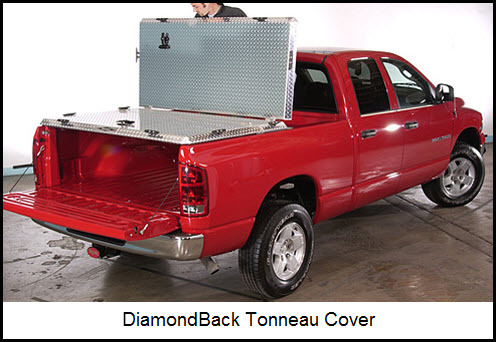 DiamondBack Tonneau Covers are built tough, just like your pickup truck!!! DiamondBack Tonneau Covers don’t float like a butterfly, but they sure look like a big silver butterfly when the front and rear panels are in their open upright position. 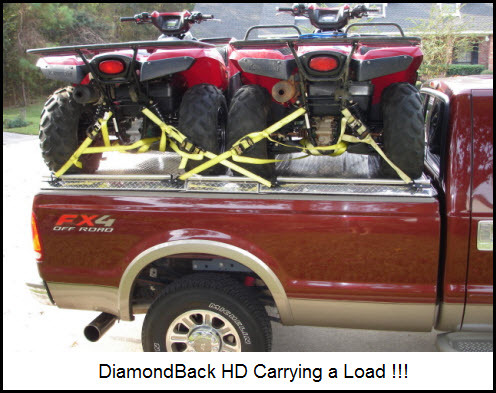 All three models of these folding truck bed covers from DiamondBack are made of 3003 alloy brite aluminum tread plate. The big difference between the models being the thickness of the aluminum plate. All the external hardware is made of stainless steel, while all interior hardware is zinc plated steel. The three aluminum panels (these folding truck bed covers could also be referred to as “trifold tonneau covers” in some literature) can optionally be coated with Black Line-X Xtra Coating with Kevlar for added protection or in any of 6 optional colors. This Line-X Xtra Coating also gives these DiamondBack Tonneau Covers better traction if the top is wet and you’re doing a dance or having a party or maybe just going ATV'ing for the day. Maybe an option to look at is the Line-X Tonneau Cover which is like a DiamondBack LT model but with the Line-X goop already sprayed on at the factory. Anyway, here’s more features specific to each of the models. Manufacturer : DiamondBack Automotive Accessories.